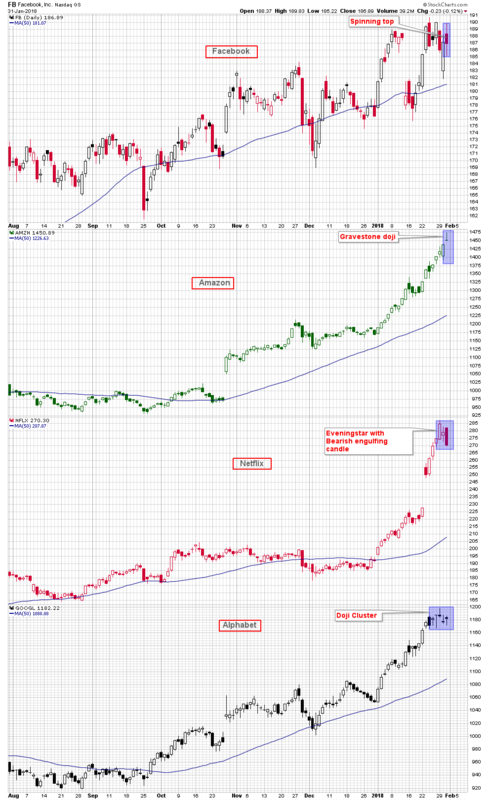 A group of interesting candle patterns formed on the charts of four of the most interesting stocks in the the technology sector. 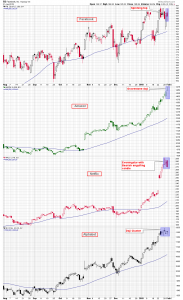 The price action in the fabled FANG stocks, Facebook (FB), Amazon (AMZN), Netflix (NFLX), and Alphabet (GOOGL), in Wednesday’s session formed candles or multiple candle patterns that reflect, at the least, investor hesitation and, at worst, reflect signs of apprehension. First up is Facebook which has been seeing some volatility this month and has continued to produce volatility post-market today, after reporting earnings. Following Tuesday’s gap down open Facebook was able to power back up later in the session and close up on the day. Today a spinning top formed which is a candle comprised of a centered opening and closing range “real body” and a long upper wick or shadow and long lower tail or shadow. It is a clear visual representation of investor indecision. Next is the Amazon chart and here there has been little hesitation or volatility, just a pictograph of a stock price that has been moving higher. In today’s session, however, an ominous sounding candle formed – a “gravestone” doji. The gravestone is a candle whose close is at or near its opening price and situated at the low of its overall range. These candles also have long upper wicks. They are called gravestone dojis because they are often seen at or near highs after long uptrends. Now it would be simply foolish to call a top in a stock with the momentum of Amazon, and this candle will need follow-through confirmation, but it is something to monitor. Today a bearish individual candle and a bearish three-day pattern formed on the Netflix daily chart. On Monday the positive price action in the stock formed a large white candle. It was followed on Tuesday with a shooting star, a smaller version the shooting star on today’s Facebook chart. A large dark or down-day formed in today’s session. This three-day sequence of candles is called an eveningstar formation and reflects a transition in investor sentiment from bullishness to bearishness. It is considered a fairly reliable bearish candle reversal pattern. Wednesday’s dark candle is called a bearish engulfing candle because it encompasses the overall range of the previous day’s shooting star candle. As you might guess this engulfing candle also is one that appears at the highs of an uptrend. Finally, a cluster of small doji candles formed on the Alphabet chart over the last five trading days. The center three candles form a tri-star pattern, one whose second doji is higher than its first and its third doji is lower than the second. Again, the doji represents indecision and the tri-star pattern represents bearish transition. There was a doji cluster on the C.H. Robinson Worldwide (CHRW) chart just before the company reported earnings and it did not play out well. The stock has dropped 5% and looks like it is headed lower. That decline in the end is a function of the markets interpretation of the earnings report, but the doji cluster could have been a warning sign. The takeaway from the neutral-to-bearish candles on the FANG charts is that traders holding long positions should be cautious. This is a very powerful group of stocks so getting aggressive and taking short positions would require clear pattern confirmation and still be highly speculative.